As predicted by the press and pre-election polls, we've ended up with a hung parliament and the 3 main parties are now doing a fair amount of negotiating behind closed doors to come up with a deal as to who will lead the country. 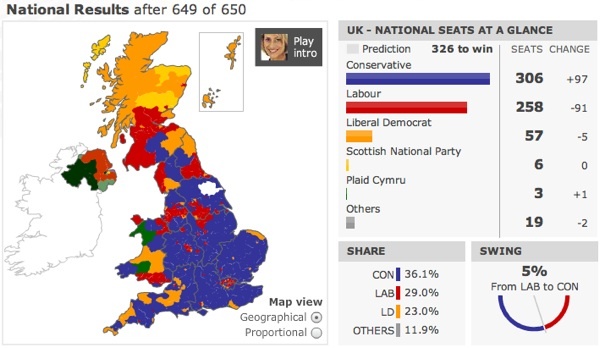 As you can see the from the results, no single party managed to get past the post of 326 votes first, so we're either going to end up with a coalition (Conservative - Lib Dem, or Labour - Lib Dem) or a minority government run by the Conservatives. Now the minority government route is technically what the population has voted for. The Conservatives did receive the mosts posts so they technically should lead the country. However with a minority government, this could pose to be quite difficult as the combined opposition can easily quash any plans the Tories may have when it comes to passing new laws etc. So that brings us to the coalition options. A Conservative - Lib Dem coalition would mean the Conservatives can run the country with a bit more confidence in their plans getting through, however it's technically not what the people have voted for. This could actually work out quite well for the Conservatives in a cunning and risky sort of way. In the last hung parliament in 1974, another election took place later that year. If the Lib Dems agree to a coalition with some of the Lib Dems getting seats in the Conservative cabinet, David Cameron can make Vince Cable the finance minister and then sit back and watch. If the economy starts to go TU, he can quickly call an election and point fingers saying "Look what the Lib Dems have done. Remember Labour wanted to do the same thing." Of course this is very risky and could be their downfall if the economy actually manages to recover to such an extent that Britain is able to cut it's deficit significantly enough without having too much of an effect on the population or things go so bad that the UK becomes the next Argentina or Zimbabwe (not Greece as we can still devalue our own currency). Of course this is just my imagination being a little silly and far-fetched; I don't for one moment think this will or should happen. Then there's the Labour - Lib Dem coalition. As Labour are the incumbent power, they constitutionally have first dibs at forming a coalition government, ignoring the fact Nick Clegg of the Lib Dems believes the party with the largest mandate, the Conservatives this time round, should get first dibs. I don't think this would go down too well with the electorate and may cause a higher degree of resentment for politicians and politics in the country and would certainly turn a lot of people off the idea of politics with a lot of people wondering how the two losing parties ended up being the winners. It would also mean the UK would end up with another unelected prime minister. A man aged 59 was squatting in a luxury home near the Houses of Parliament last night. 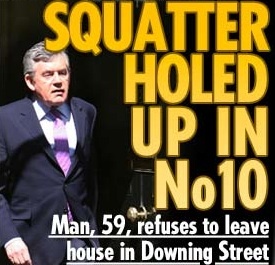 The squatter, named as a Mr Gordon Brown from Scotland, was refusing to budge from the Georgian townhouse in Downing Street, central London – denying entry to its rightful tenant.